SKU: B150 21 26 47 53 52 83 92 Sd. Categories: Ashley, Youth Bedroom. Tag: B150. 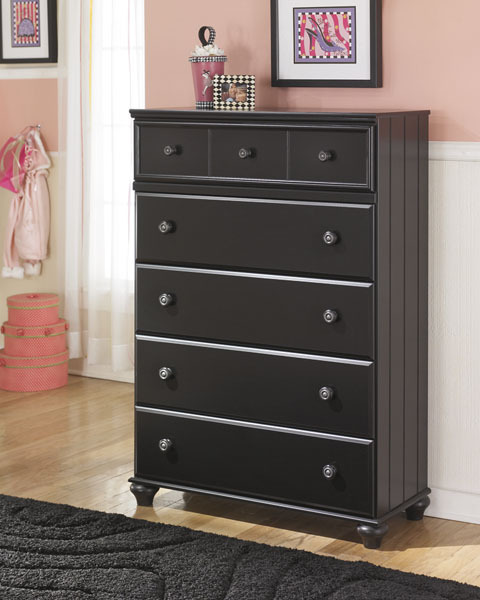 With the replicated black paint finish surrounding a comfortable cottage design, the “Jaidyn” youth bedroom collection captures the vitality of youth within a collection that fits flawlessly into any child’s bedroom. The decorative moulding, turned bunfeet and stylish pickle fork groove details are bathed in a black finish that beautifully complements the relaxed cottage design. With the large turned wood knobs decorated with pewter finished metal rosette inserts, this furniture creates the perfect atmosphere for any child’s room. Give your child their own special place with the beauty and comfort of the “Jaidyn” youth bedroom collection. Series Features: Replicated black paint. Decorative moulding on headboard, mirror and drawer fronts. Turned ball finial on poster bed. Bunfeet on case pieces. Pickle fork groove detail on case sides and bed panels. Large turned wood knobs with decorative pewter finished metal rosette inserts. Side roller glides for smooth operating drawers. B100-11 Twin or B100-12 Full Roll Slats can be used in substitution of a box spring. Modern bookcase sideways storage bed features deep storage drawers.